This new generation engine is based on the 2.5 R5 TDI and created especially for Volkswagen Crafter in 2006. It is an inline five-cylinder (R5) turbocharged direct injection (TDI) diesel engine. It also has cast iron (GG350) cylinder block, SOHC driven by timing belt, aluminum 10-valve head, and hydraulic bucket tappets. But now the engine is equipped with the latest Common Rail (CR) fuel system. To meet the increased demands for power, acoustics, emissions, fuel consumption and to extend maintenance intervals, many components of the engine were redeveloped. 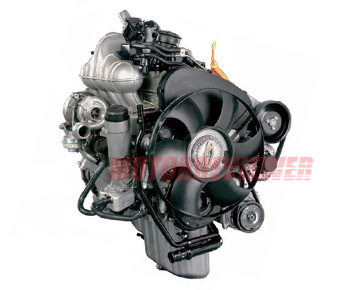 This engine got a diesel particulate filter (DPF), electronic throttle control, EGR cooler and electronic EGR valve control, engine oil level sensor for increasing maintenance interval. The engine boosted by variable geometry turbocharger. All 80kW (107hp) versions and higher goes with an intercooler. Common rail direct injection pump produces pressure up to 1,600 bars. The operation of all systems is controlled by Bosch EDC16 electronic engine control unit (ECU). The engine power range is between 65-120kW (87-161hp). This generation complies with the Euro IV European emission standards. Inline five-cylinder engines were entirely replaced by more compact Volkswagen V6 TDI engines (3.0 TDI, 2.7 TDI) in 2011. The 2.5-liter TDI CR had some turbo failures, which caused high oil consumption. The 2010 version of the 2.5 TDI CR engine was redesigned, correcting the previous problems of turbo failure. The DPF life is about 100,000 miles. Many DPF problems are down to faulty pressure sensors. BJJ - 87 hp (65 kW)/3,500 rpm; 162 lb ft (220Nm)/2,000 rpm. BJK - 107 hp (80 kW)/3,500 rpm; 207 lb ft (280Nm)/2,000 rpm. BJL - 134 hp (100 kW)/3,500 rpm; 236 lb ft (320Nm)/2,000 rpm. BJM - 161 hp (120 kW)/3,500 rpm; 258 lb ft (350Nm)/2,000 rpm.